So many recipes done , yet so many more to go! I thought it would get easier to make a choice on what to make but it hasn’t yet! This week needed to be a pudding to follow a b-b-q with my mum, hubby, my other mum and dad and the hairy hoolies! 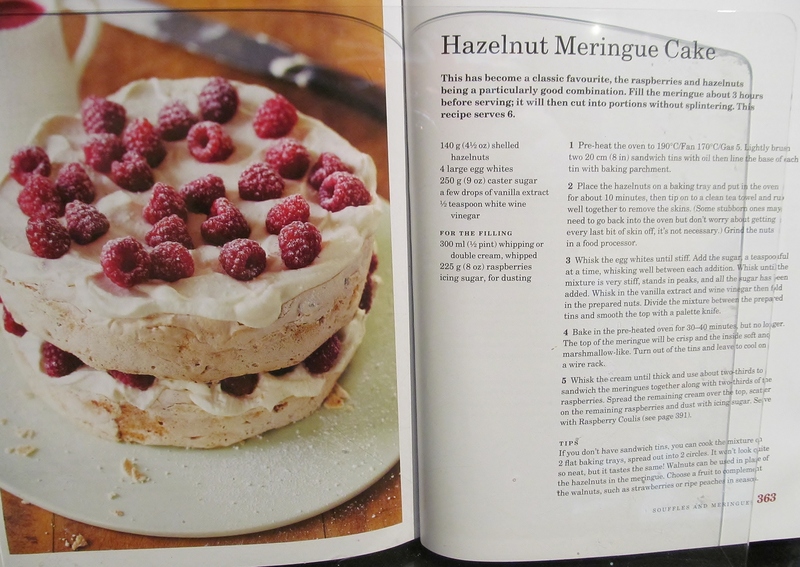 I made the meringue as Mary Berry’s Baking Bible described, and folded in some ground hazelnuts at the end. Then I had to pour the mix between 2 lined sandwich tins which would help the meringue hold it’s shape. Then into the oven they went and I set the timer. When the pinger went, I took the tins out, allowed them to cool slightly and then tipped them out and put them on the cooling rack. I left them to cool totally and put them in an airtight container overnight. 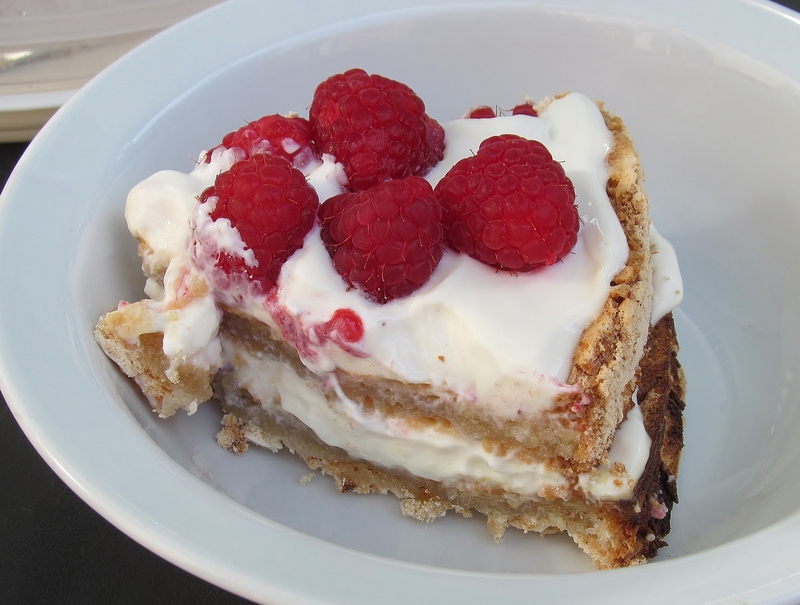 The next morning, I added some weightwatchers thick cream and raspberries to the middle and top and put the whole thing in the fridge. Mary recommends you do this at least 3 hours before you want to eat it so that it will slice easily. Well, Mary was right, it did slice beautifully and made a nice light pudding to finish off the b-b-q on a lovely summers day. 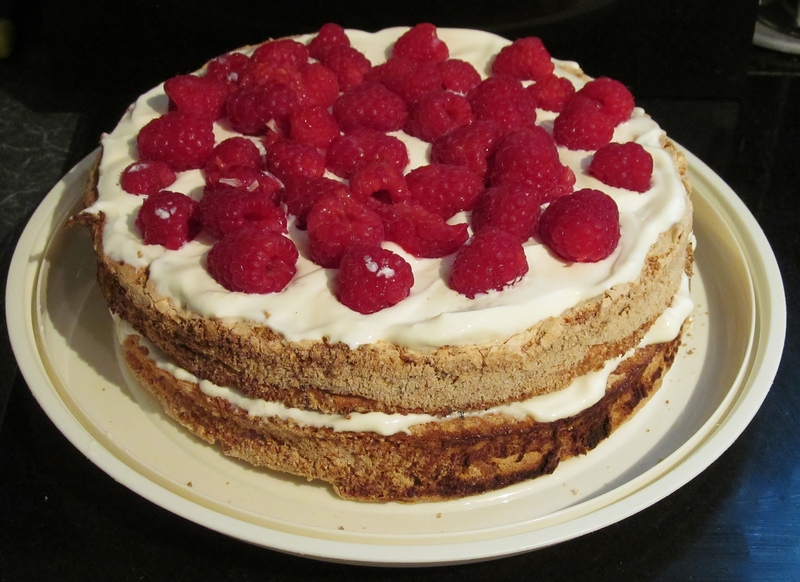 This entry was posted in Kim's cake challenge and tagged Baking and Confections, Baking Bible, Cook, Cream, hazelnut, hazelnut meringue, Home, Kim's hazelnut meringue, kims cake challenge, Mary, Mary Berry, mary berry's hazelnut meringue, meringue by kimsideas. Bookmark the permalink.